Sonic Junction is delighted to welcome Blues Harp Master Dennis Gruenling to our teaching team. Dennis Gruenling is without a doubt one of the baddest, swingingest, most innovative harmonica blowers on the planet. His dynamic style draws inspiration not only from Blues icons like Little Walter, but also from great jazz horn players like Lester Young and Illinois Jacquet. Equally adept at chromatic and diatonic harmonica, Dennis rocks and swings with a vengeance – snapping his fingers, blowing cool and soulful lines with a natural ease as the band drives with a steady, swinging beat. After receiving his first harmonica as a gift from a family friend, he had heard his first blues record and his life was never the same! Dennis already was a life-long music fan (having grown up on country & western and oldies), and already was acquiring a decent record collection (thanks to his obsession with music & his own radio show in high school), but the harmonica took him in a whole new direction. Before long, Dennis was tracking down all the harmonica and blues records he could find, all the while trying to learn as much as he could. Having spent time in New Orleans during 1992-3, Dennis came back home to the Garden State of NJ and quickly gained a reputation as a young rising star on the local scene, working in a couple different local blues bands. In addition to studying the classic harmonica & Chicago Blues records (Little Walter, Big Walter, James Cotton, Muddy Waters, etc…), Dennis also “cut his teeth” on some classic blues/R&B/swing saxophone records from the likes of Illinois Jacquet, Willis Jackson, Red Prysock, and Gene Ammons. In 1998 he started to form his own local “all-star” band (including saxophonist Joel Frahm). Ever since his self-titled debut with that band (Dennis Gruenling & Jump Time!) 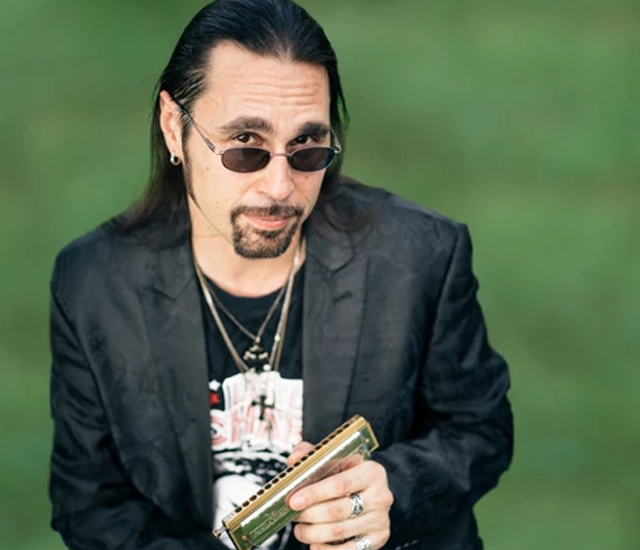 hit the streets in 1999, Dennis has pulled in countless fans and numerous accolades from critics & musicians around the world for his swinging, highly original harmonica sound and style. Taking equal parts from the harmonica and swing/saxophone traditions and styles, Dennis has pushed the boundaries further for the sound of blues harmonica, while in the meantime pioneering a whole new sound and direction for the harmonica. Through the years, Gruenling has shared the stage with many top names in the blues & roots world, such as Pinetop Perkins, Snooky Pryor, Homesick James, Nappy Brown, John Mayall, Southside Johnny & the Asbury Jukes, Little Sammy Davis, A.C. Reed, Mick Taylor, and Jimmy Dawkins, as well as contemporary blues masters such as Rod Piazza & The Mighty Flyers, Rick Estrin/Little Charlie & The Nightcats, Kim Wilson, Rusty Zinn, Steve Guyger, Greg Piccolo, Peter Karp, and Mark Hummel. Currently, Dennis has signed with the VizzTone label group and released his fifth album (“Rockin’ All Day“), along with his touring and recording partner Doug Deming, who also released a brand new disc featuring Dennis on VizzTone. They have BOTH been in the Top Ten of the Living Blues Radio Charts for 3 consecutive months. Doug Deming & Dennis Gruenling w/The Jewel Tones can be seen touring throughout the US in support of their new VizzTone releases in 2015! Teaching blues harmonica has also been an interest and passion for Dennis, and he is in demand as a private instructor and as part of numerous harmonica workshops and conventions that appear across the country (and around the globe). Some of the workshops he’s been part of include Jon Gindick’s Harmonica Jam Camps, David Barrett’s Harmonica Masterclass, Guitarrentage-Schorndorf (Germany), Euro BluesWeek (UK), SPAH Harmonica Convention, Buckeye Harmonica Festival, Turtle Bay Music School (NYC), and Joe Filisko’s class at the Old Town School of Folk Music (Chicago). In addition to teaching, recording & performing with Doug Deming, he sometimes participates in other projects such as: David Malachowski & the Woodstock All-Stars, Maria Woodford, and the Rockin’ Daddies. With any remaining time, he may be customizing or re-building some vintage bullet microphones, or watching some David Lynch movies. Dennis Gruenling with Dave Gross, "Lookin' Sharp"
Dennis Gruenling with Dave Gross, "Buffle Off to Shuffalo"